Did you have a good weekend? Did your team win the Super Bowl? I’m so sad that football is over for seven months! Seriously, it’s super depressing! I’ll have to find more things to do now on Sunday afternoons… what’s a girl who has a DIY blog do on a free Sunday afternoon?! 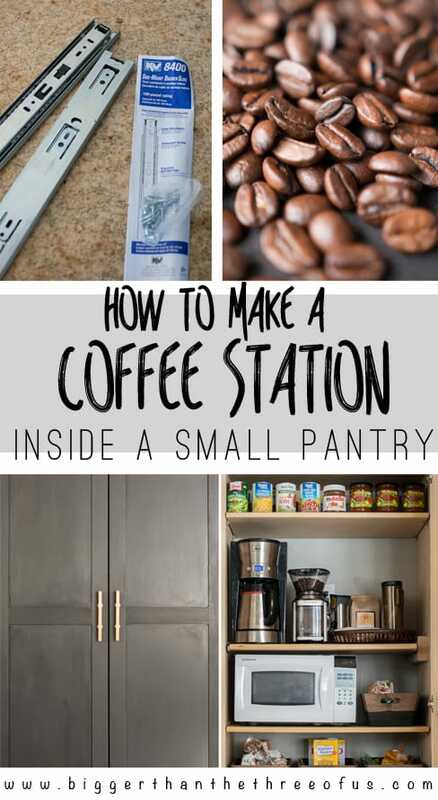 Anyways, today I’d like to talk about How to Create a Coffee Station within a Small Pantry. 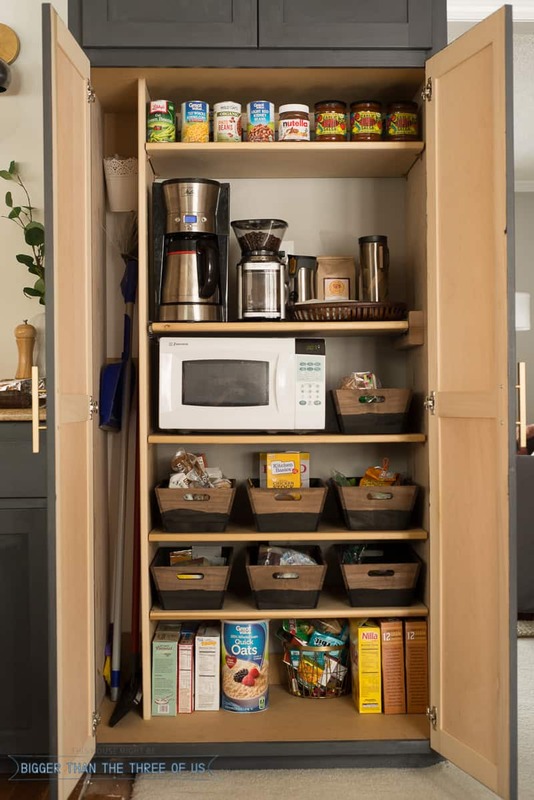 When we planned our pantry, the one thing that I HAD to have was a coffee station or “appliance garage”. Coffee pots, grinders, microwaves, etc., can not only be an eyesore on the counter but also take up valuable counter real estate. So, let’s talk about how we created a spot for the coffee station (and we’ll throw the microwave in as well). So, if you read my post last week about organizing the pantry, then you know I had a big un-organized mess. I HAD to get organized because I wanted to have a coffee station within the pantry. So, we got organized and created a small setup that is working great for us. Ready to jump right in… it’s a pretty easy one. 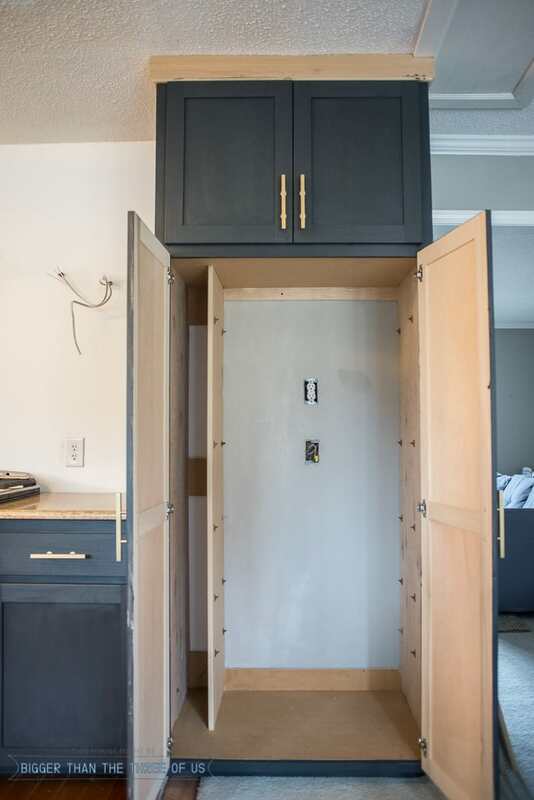 When we built the pantry, we built it without a back. We did this for two reasons: 1) It saved money on wood, which didn’t matter because the back isn’t visible from the outside. 2) We wanted a coffee station and knew it would be easier to access the electrical outlets without the wood. We could have cut the electrical outlets out of the wood and put extenders in so that the electrical outlets could be accessed. This would have been an upgrade and, to be honest, I’m not big on upgrading things that aren’t going to be noticeable 98% of the time. So, we built the cabinet without the back. I had electricians come over to put in some new outlet plugs where I thought I wanted the shelving to go. I wasn’t exact here because I knew I’d have a little bit of play with the cords on the appliances. We picked up some drawer slides rated for 100 lbs. When we went to mount the drawer slides in the pantry we had no problem mounting the left side. Once we were ready for the right side, we ran into a pretty big problem. 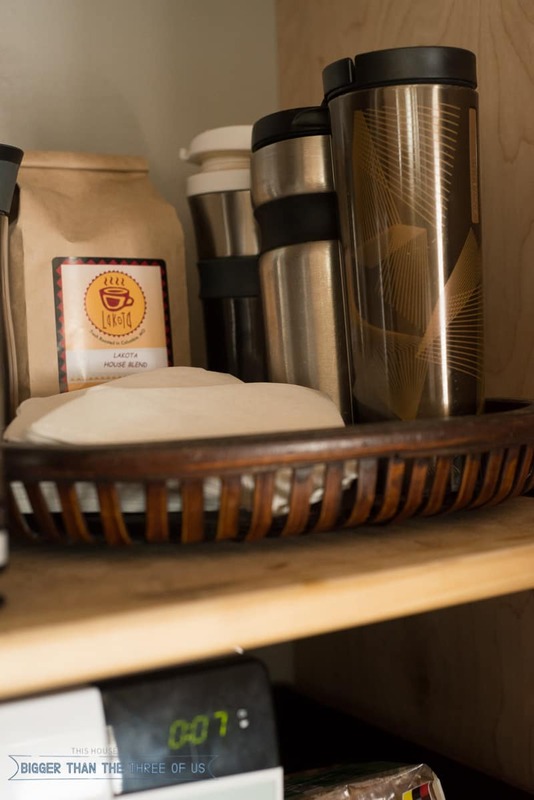 We wanted the shelf to be able to extend outside the pantry doors to allow for steam (from the coffee) to escape. The shelves were built to be adjustable BUT they required a clear entry from the front for the full width of the shelf. 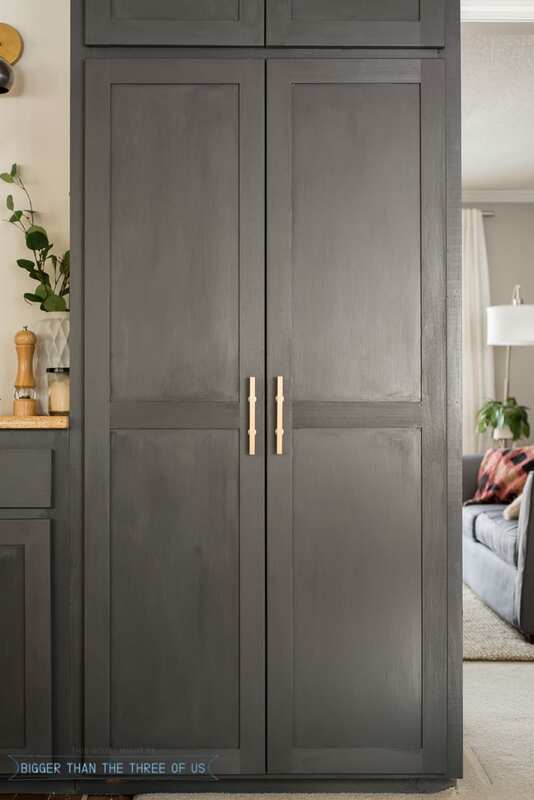 Meaning the shelf could not extend past the door because it wouldn’t clear when the hinges of the door mounted to the pantry. This caused a huge issue. To make it work, we cut the shelf so that it had clearance around the hinges/door. The shelf was then too short to mount to the slides so we fixed this by mounting a 2×4 to the right side of the pantry (where the drawer slide was going to mounted). Then, we mounted the drawer slide to the 2×4 and attached the shelf to the slide. It’s not a pretty fix, but it works for us. We’ve been using this set-up for about a month, maybe a bit longer and it’s been awesome! 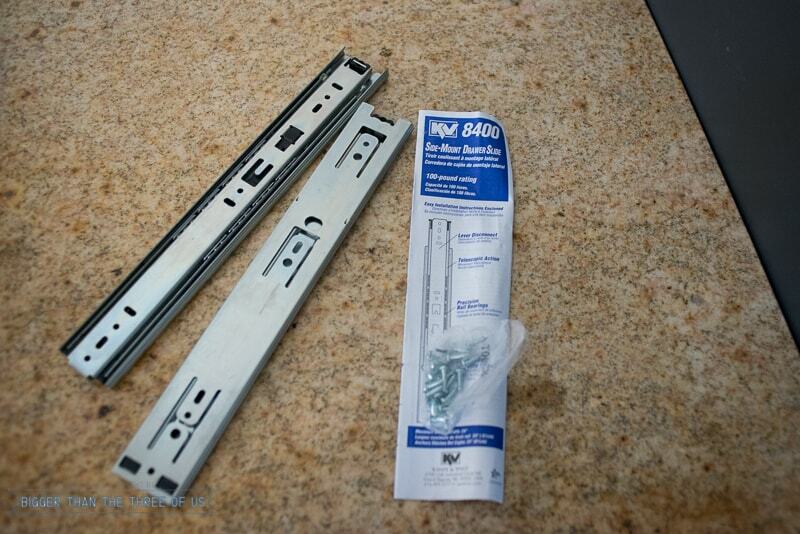 If you pay to have the electrical run and buy the drawer slides, you are probably looking at about $75 from start to finish. I think that’s a great price. *So, I don’t think I really showed the issues well with how the shelf slides so I shot a quick video. Hope this explains it just a bit better.